With global economic activity shifting from the West to the East, competition between Middle Eastern and Asian maritime nations intensifies in their bid to attract a bigger slice of the global shipping industry’s diverse revenue streams. As a result, established Far Eastern shipping centres in Hong Kong and Singapore are already capitalizing from the eastwards focus of global economic activity while new giga-projects such as Saudi Arabia’s US$5.2 billion International Maritime Industries (IMI) mega yard spring out literally from the desert, offering more alternatives to shipowners and providing more competition to the continent’s maritime service and manufacturing sector providers. “As trade grows and the control of ships and cargoes shifts eastwards, we are seeing the emergence of new clusters and shipping centres. Increasingly from Vancouver to Hong Kong and Dalian to Ras Al Khair in Saudi Arabia, stakeholders in maritime sectors are looking to create a fertile environment to support and drive trade and innovation providing the services and ecosystems that ship owners, ship managers, ports, service suppliers and startups need in our fast developing and digital world,” said Nicholas Brown, Communications Director, Marine & Offshore Division, Bureau Veritas. 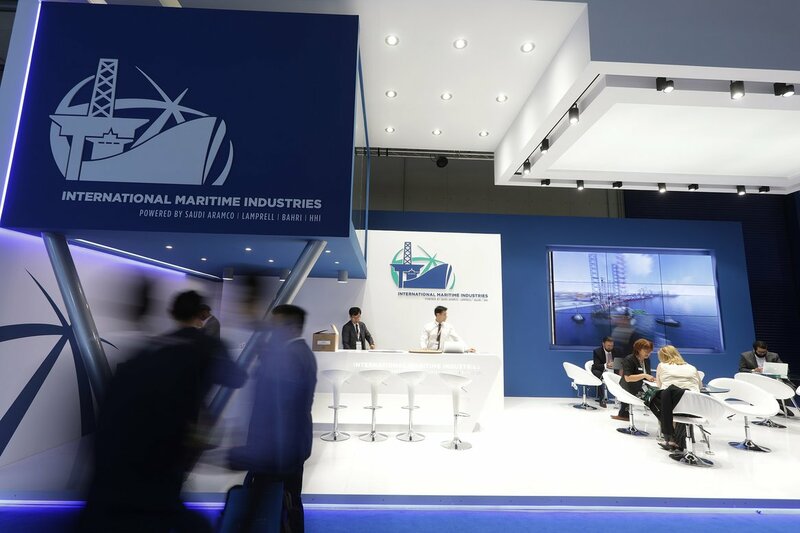 Posidonia 2018 was the venue chosen by Saudi Arabia for the global launch of a flagship maritime project designed to feed into the Kingdom’s Vision 2030 for economic and social reform. Located on the east coast of the country, the cluster will eventually be a fully-fledged maritime centre. Anchored by the US$5,2 billion, giga International Maritime Industries (IMI) ship building facility, the King Salman International Complex aspires to attract a growing portfolio of international clients from both hemispheres banking on the cost efficiencies its fully integrated set up is claimed to be able to provide. “As the flow of trade moves from the West to the East, our strategic location, being a mid-point in that route and on major international shipping routes, can provide customers the convenience of timely maintenance repairs & overhaul (MRO) and newbuild projects thanks to all our build-in efficiencies, integrated supply chain processes, production schedules and state-of-the-art facilities. The cluster will have the ability to offer the full suite of products and services in one mega location,” said Hani Mohammed, Chief Financial Officer, IMI. In the meantime, the more mature Far Eastern maritime hubs are already seeing significant increase in demand for their services and real estate offering, mainly from European shipping companies looking to tap into the burgeoning Asian economies of South East Asia and China. As to how does Hong Kong view the potential impact on its booming business from the emergence of new maritime clusters in the Middle East, Kant is confident that there is room for everyone. “Thinking of Dubai and Saudi Arabia, they are very much growing their shipping industry capabilities and offering, and they are well positioned to tap into the markets of the Gulf states (GCC) and the Indian subcontinent. “Hong Kong positions itself as the gateway to mainland China as a special administrative region with special ties to China. Also Hong Kong, apart from being a gateway to China for the maritime sector it is also a place with a lot of expertise, a large merchant fleet and the ambition to become a centre of maritime excellence, in all sectors including insurance, technical expertise, arbitrage, Fintech and ship financing. “Apart from the 1.4 billion market of mainland China, for which we are the natural gateway, Hong Kong also wants to have a regional function because from there you can reach out to the markets of South Korea, Japan, Philippines and Vietnam,” she added.